Barak Obama is street art. So says the work of the artist Shepard Fairey, whose “Hope” poster became the visual emblem of the Obama campaign. Fairey’s roots in street art signaled the ascent of an art form most often associated with vandalism to worldwide legitimacy. Fairey distributed 300,000 stickers and 500,000 posters during the campaign. A year later, with Obama in the White House, Fairey’s poster was officially displayed in the National Portrait Gallery in Washington, D.C. And in July 2010, the British Prime Minister David Cameron presented Obama with a painting of giant colorful letters by the street artist Ben Eine. Welcome to your first street art President! Fairey has since cooled off in his ardent support of Obama, but Obama is still a very popular character in street art all over the world. 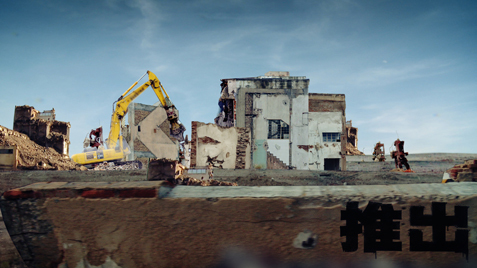 And street art is bigger news than ever. 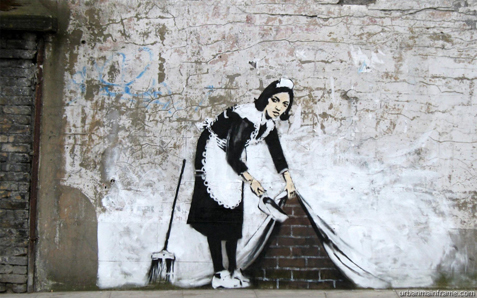 Graffiti works by the British artist Banksy are auctioned off for as much as seven figures. 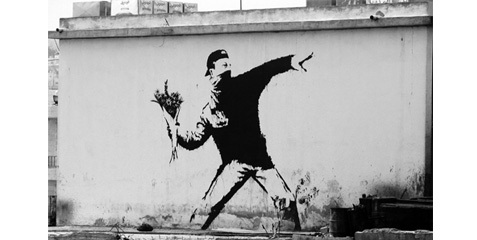 People argue if some stencil they found on a wall in some part of the world is a Banksy. In what is perhaps the most important sign of street art’s arrival is that Banksy recently directed the opening to the Simpsons. And look for “Exit through the gift shop” – a recent documentary made by Banksy, which shows (perhaps mockingly) the rabid excitement that street art causes on the current art scene. 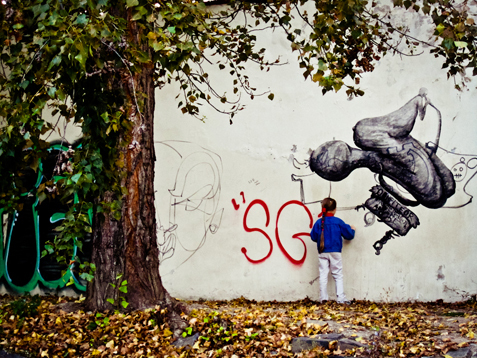 What is so appealing about street art? Actually, street art is quite a loose term. It has come to describe any art created in public spaces, although it usually refers to unsanctioned art. It includes many modes of expression like traditional graffiti, stencil graffiti, sticker art, poster art, video and street installations and even flash mobbing. There is a term for everything. It is safe to assume that street art will continue to evolve and many new types of artistic interaction with the street will grow under its umbrella. Perhaps what appeals about street art is how it plays with pop culture symbols that we constantly drown in on a daily basis. And it’s other appeal may be emotional. Street art is aggressive and impermanent. Much of it is here today and painted over tomorrow. Now that some artists have achieved fame and become brands, one would expect their street art works to be better protected but that’s just for the few who made it big. 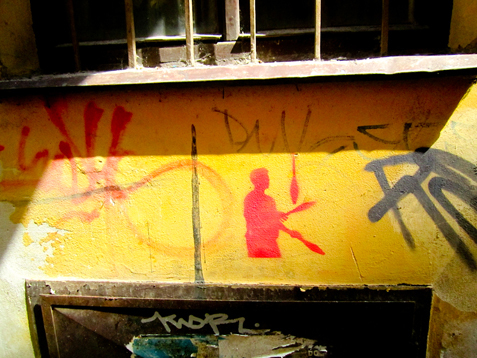 The only way to see some old street art works is through photos or videos on the web. 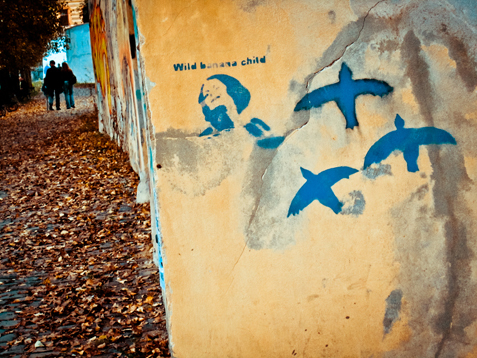 Prague should be a natural home to street art. Just take a look up as you walk the city. Numerous houses are decorated by all manner of designs, faces and figures. 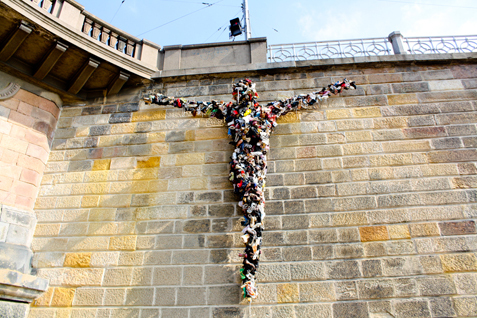 These art objects accompany the trek of everyone on a Prague street. Although these decorations are installed with permission, you would quickly get into dicey territory if you start defining what art needs permission and what doesn’t. Is art only what’s socially acceptable? That doesn’t sound like art. Does art belong only in museums and galleries? That doesn’t sound like art either. And then there are those who take to the streets and confront the city’s residents with their creations, whether they asked to see them or not. Where do you draw the line between someone who just signs his name all over the city’s walls or a committed artist who uses the city as a canvas and it is beneficial for society to let him or her do so? These kinds of questions always surround street art and perhaps provide the reason for why this artistic expression is so constantly evolving. Not to mention the bigger question of what kind of cities we would like to live in. What do our cities tell about who we are? 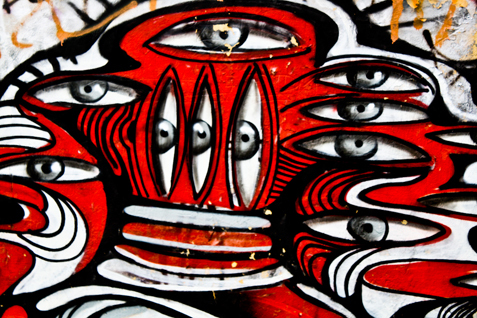 Street artists challenge the meaning of what is an art work just by the sheer act of taking art into our everyday life. It’s not art you have to pay for or request because it was mentioned by some source of authoritative information. 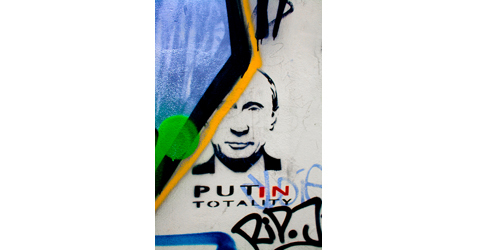 As such, there is a strong element of activism and subversion of the pop culture’s symbols in many street art works. While street art has grown in legitimacy, one formal challenge it faces would seem to be diversifying the kinds of works and messages the artists produce. Perhaps the foray into the mainstream will keep attracting more and more different artists to the streets, resulting in an even greater expansion of this vibrant art form. 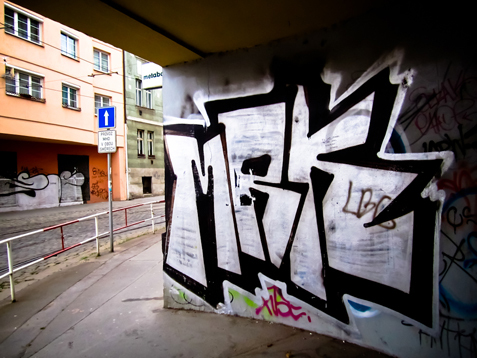 Some Czech street artists that have achieved renown include the mysteriously named CRYPTIC257, POINT, PASTA, SKARF, MASKER, TRON and EPOS 257. 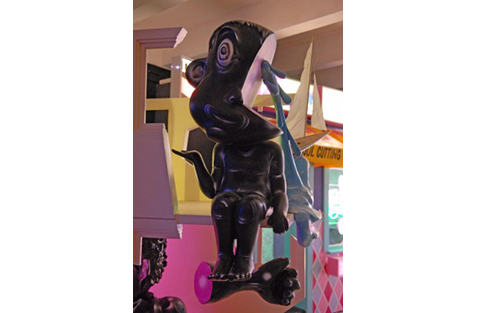 Most of these artists are professionally trained and have work exhibited both in the streets and in galleries. You can see some of their creations at METROPOLIS, an exhibit that’s currently running at the DOX Centre for Contemporary Arts. The exhibit has recently returned from a successful run at the Czech pavilion at Expo 2010 in Shanghai. The artists recreated a contemporary Prague metro station, with their individual approaches demonstrating well the different formal directions street art can take. The exhibit runs till December 31st and costs 180 CZK to attend. We spoke with Skarf, an artist whose work is part of the current exhibit at the DOX. 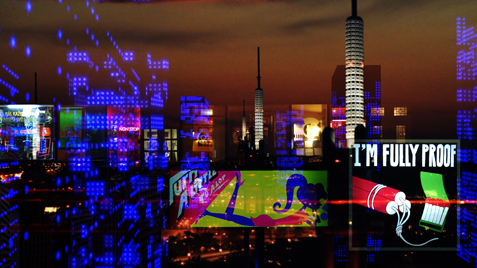 For “Metropolis”, he created a time-lapse video montage monitoring the transformation of an environment over time using the sights and sounds of urban life. Skarf is one of the first Czech graffiti artists and has expanded on his street art roots to direct short films, TV jingle and music videos. He studied film animation and dramatic direction at the Prague Film Academy. What was most attractive to Skarf (Jan Zajíček, b.1977), when he was a student at the Arts school was the street as a gallery, as communication medium. “You could also say that street art is dangerous. 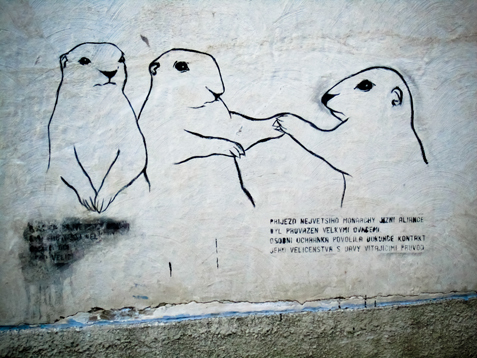 The controversial aspect of street art comes from this truth – that it’s not clearly lawful… that’s why it’s interesting. It doesn’t respect the rules of materialistic society where everything that´s paid for is what´s allowed.” It´s a free art form that can´t be controlled, that can stand up to “the commercial spam on the street”. In the next two articles, we will focus more closely on graffiti and stencil art of Prague, as well as on installation works, featuring interviews with leading artists and figures in the street art community. We Want Your Photos of Prague!